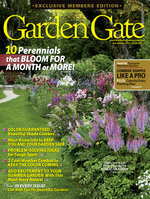 Don't feel limited in your shade garden. Mix it up and add a pop of color with these 6 unique spring flowers! 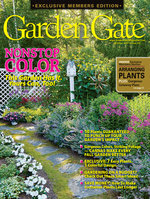 Get color everywhere in your yard! Shade doesn’t have to be the exception, especially in spring. Whether buds are poking up through the last patches of snow or a blossom greets you on the first sunny and warm day, unique spring flowers can instantly brighten any spot — even dappled light or dense shade. The plants featured here take varying degrees of shade, so after trees’ canopies leaf out fully, they can still thrive. 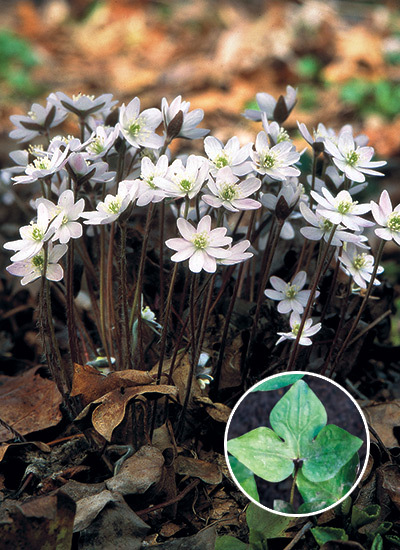 Some, such as sharp-lobed hepatica, are among the first blooms in early spring. And others, like the yellow archangel, will transition your garden from late spring to early summer. No matter if these flowers open in early, mid- or late spring, though, they provide some of the first food for pollinators as temps start to warm and beneficial insects become more active. The variety of bloom shapes and sizes not only adds a variety of texture to your garden, but it also attracts a diverse range of pollinators. Scroll on to learn more about each of these peculiar spring beauties — they might be just the spring flowers you need for your shade. 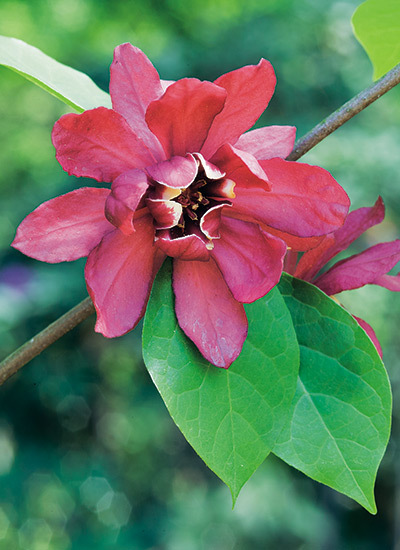 Also called “Carolina allspice,” sweetshrub has very fragrant blooms and glossy green, deer-resistant foliage that turns bright yellow in fall. Sweetshrub's naturally rounded shape is easy to maintain — simply prune branches as needed when blooms finish. No matter where this perennial grows, its leaves take on a gorgeous bronze or red once the weather starts to cool in fall. In early spring, simply cut back any damaged leaves. 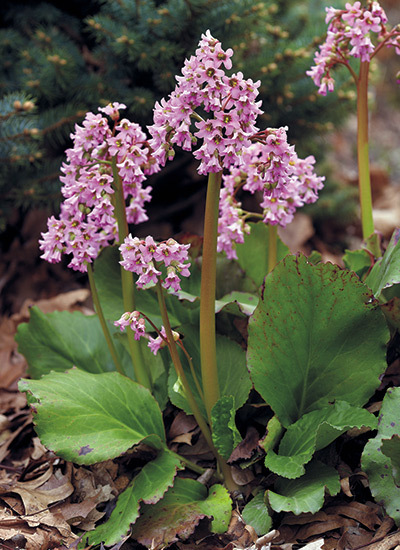 Although bergenia may have more blooms in more sun, its foliage does best in shade, where soil won’t quickly dry out and cause leaves to burn. 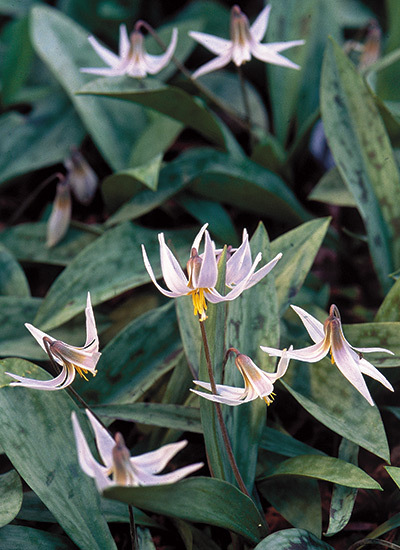 With interesting reflexed, or backward curving, early spring flowers and standout green-and-brown-mottled leaves, this slow-growing flower is worth the wait. Young plants emerge with just one basal leaf, but as it matures, two leaves and one white bloom appear. 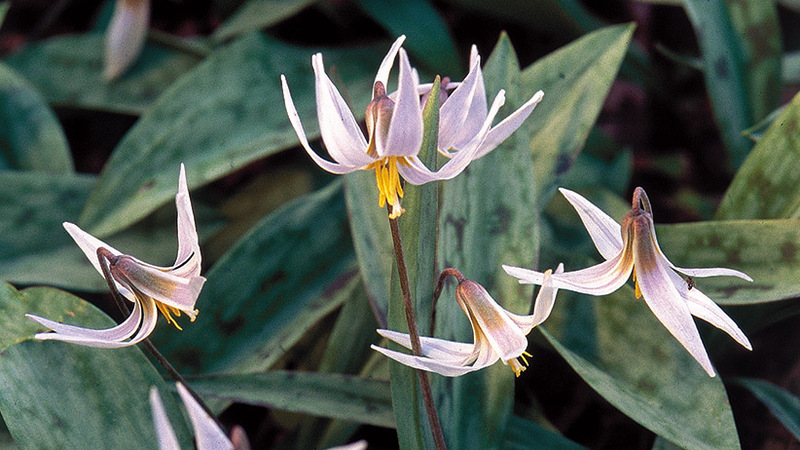 White trout lily does best when corms are planted in fall instead of grown from seed. Plants spread slowly so don’t dig and divide for more. It goes dormant in summer heat. 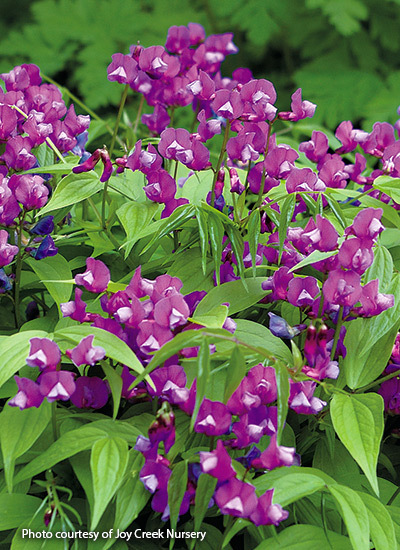 This short flower is easy to tuck under shrubs or perennials that bloom a little later in the season. There, they’ll add a dense mat of color and still get enough dappled light as the foliage and flowers above open. While it’s in bloom, make sure soil stays moist, but after flowering is finished, keep the area as dry as you can. In early spring, thin, fuzzy flowers in shades of pale blue, pale pink or white emerge from the previous year's dead foliage. The mottled, pointed, three-lobed leaves in the inset photo don’t appear until after plants bloom. Sharp-lobed hepatica doesn’t like to be disturbed. So instead of digging and dividing, try collecting and sowing seeds just after the seedheads form, or let this slow-spreading native wildflower self-seed. Spring vetch is a low maintenance mounding perennial that works well at the front of the border or in a container. In the South, pot it up and treat it like an annual because it can’t take heat and humidity. 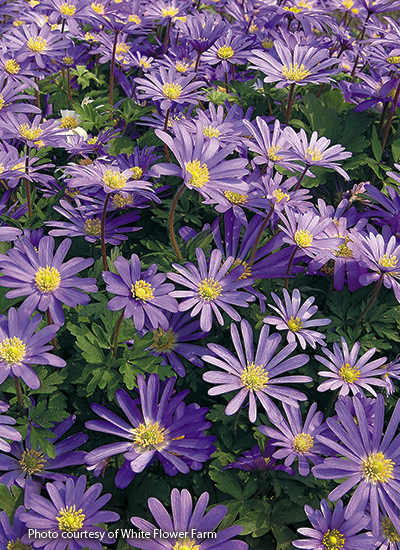 This perennial prefers moist soil. To grow plants from seed, nick the surface before sowing in spring. Spring vetch reseeds once a clump is established, but new plants could take a few years to bloom. Is your garden arbor looking lonely? Add charm to your garden entrance with this colorful plan for planting around your arbor. Small but mighty, this lovable spring bulb is hard to beat. 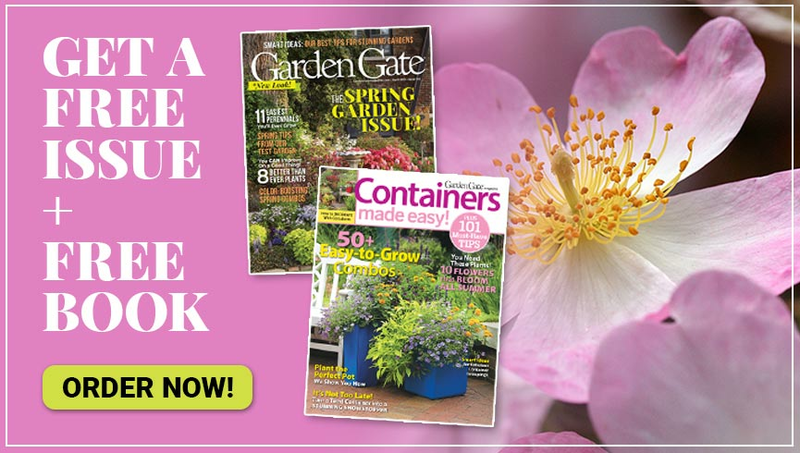 Grow your best yet with our tips for growing beautiful grape hyacinth!